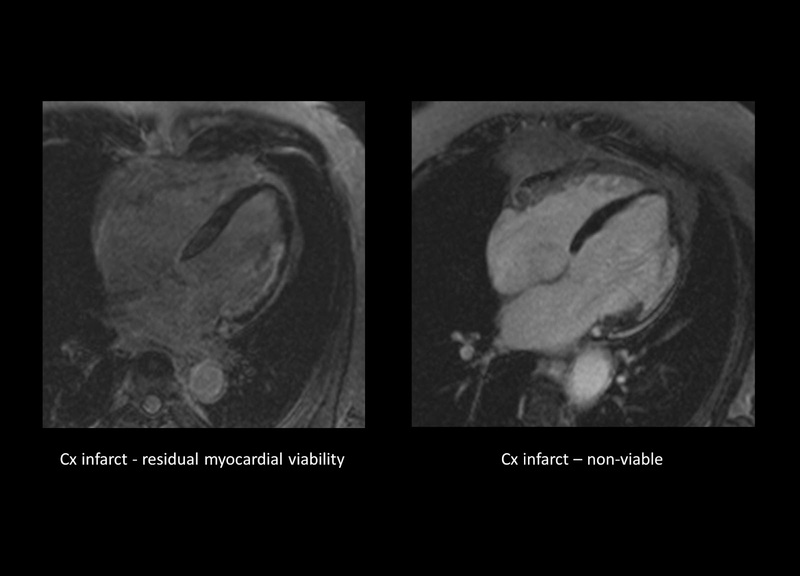 In last week's blog, I described how useful cardiac MRI is in the diagnosis of myocardial infarction. The presence of subendocardial late gadolinium enhancement is both a sensitive and specific indicator of the presence of an area of infarction. But what about myocardial viability? We're often asked to assess whether an infarcted region of myocardium has sufficient residual viability to justify coronary revascularization - but how do we do this? Well, there are two ways: a quick way, and a slightly longer (but more accurate) way. The quick way simply involves looking at the myocardium, and judging how much of the myocardial thickness is infarcted - i.e., what proportion of the myocardial thickness is occupied by late gadolinium enhancement (LGE). If the LGE occupies less than 50% of the thickness, then we judge the segment overall to still be viable. If the LGE occupies more than 50%, then it's no longer viable. If it's exactly 50%, then we say there's 'partial' viability. This method is quick and easy, but it's difficult to be precise about the percentages, and it's hard to accept that the difference between 49% and 51% is so clear-cut (especially when it has big implications for revascularization decisions). A more refined method is to say that if the LGE occupies <25% of the myocardial thickness then it's viable, and >75% means it's non-viable. If it's between 25-75%, then it's indeterminate and we need go on to perform a dobutamine stress CMR study to see whether the myocardial contractility improves with low-dose stress. If it does, then it's viable; if it doesn't, then it isn't. 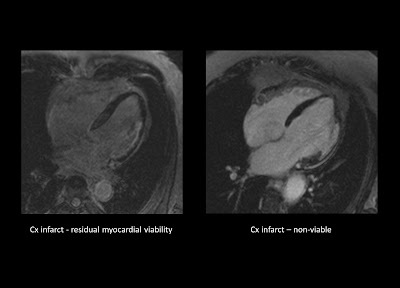 If you'd like to learn more about the use of CMR in the assessment of myocardial infarction and viability, then check out my Cardiac MRI Essentials course at Medmastery.